"It is very important what kind of character minipin have if you want it for ACTIVITIES!" 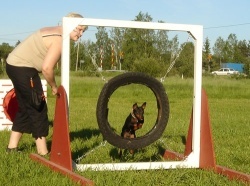 Despite of its small size Miniature Pincher is excellent dog for activities! Because of its liveliness it’s not the easiest dog to train but it surely is hardworking and almost tireless and always ready for activities. Miniature Pincher get’s more and more foothold on people’s mate in hobbies. It no longer is just a dog who sits beside its owner in the sofa or just a play pal. More often Miniature Pincher is whole family’s shared hobby. 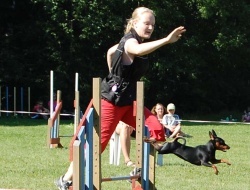 It’s no wonder that in a family mother and daughter take an interest in dog shows together and that daughter also trains agility and obedience. In the summer Miniature Pincher can go fishing with the father and it also thrives being on children’s room for hours with the youngest in the family. When having just the right character Miniature Pincher is the greatest and all-round friend for people in all ages and all sizes. Adaptable, sporty, energetic, ¨curious, open, friendly, temperamental, brave and self-confident Miniature Pincher downright calls its owners to try every possible hobby with it self. Even Miniature Pinchers doesn't have rights to compete in every sport no one says no to take an interest just for fun! 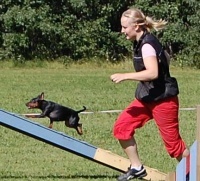 Tracking in forest or field, Searching, obedience, agility and so on.. only the imaginary of the owner is the limit. Take the challenge and see what YOU could overtake in hobbies with Miniature Pincher!